This FOTGA DP3000 Matte box (M3) is a professional device universally designed to accommodate all DSLR's and camcorders and it compatible with any industry standard 15mm rail system. The matte box gives provides the user full lighting control and prevents glare and lens flare with its foldable french flags and adjustable side wings. It features precision engineered Swing-Away mechanism for quick lens changes. It also provides a means of using filters and one of the 180 degrees rotating filter trays and much more! With competitive price, this matte box will be your optimal selection. It will greatly facilitate your digital life. -Height can be adjusted by 35mm. -Compatible with 2PCS x 200mm long 15mm rod ,center-to-center rails distance 60mm.which makes you able to mount some other device by side. -Compatible with wide angle lenses. Please Note: the baseplate support rig are not included. French Flag/Side Flags : The flags provide extra flare reduction and improves the quality of videos. The side flags are quick removable. They can be attached /detached easily.Both flags can be folded for storage. This FOTGA DP3000 Matte box (M3) is a professional device universally designed to accommodate all DSLR's and camcorders and it compatible with any industry standard 15mm rail system. The matte box gives provides the user full lighting control and prevents glare and lens flare with its foldable french flags and adjustable side wings. It features precision engineered Swing-Away mechanism for quick lens changes. It also provides a means of using filters and one of the 180 degrees rotating filter trays and much more! The kit includes one French flag, and two adjustable side wings. Each of the three flaps can be positioned and locked in place so as to suit different focal lengths by providing the maximum amount of shading without getting in the way of the shot. For changing lenses quickly, the unit features a swing away design at a 90 degrees and allow height adjustable. 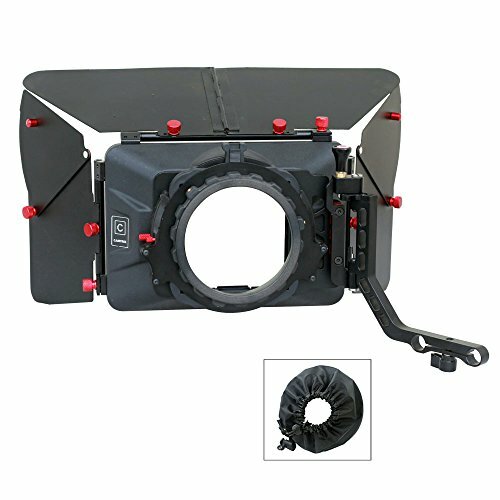 Instead of moving the mounting position of the matte box, (which may be blocked by other rig accessories, or require rod extensions to fit), it can simply be slid outwards with just one screw to undo. A set of 4 "donut" rings are included. (Size at 103mm,76mm,64mm,51mm).By fitting one of these rings, light from the rear of the matte box can be blocked out, leaving only the camera lens protruding through. Donuts are slightly flexible, and the four sizes range to fit almost any lens diameter. A set of 4 donut rings are included. 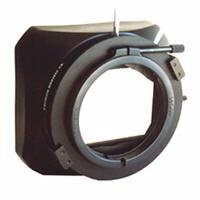 (Size at 103mm,76mm,64mm,51mm).By fitting one of these rings, light from the rear of the matte box can be blocked out, leaving only the camera lens protruding through. Donuts are slightly flexible, and the four sizes range to fit almost any lens diameter. There is a handy top handle with 5 thread holes on the matte box,it's convenient to attach some accessories on it,such as magic arms, cold shoe adapters, etc.And it's save time to install or remove the matte box from rig. Just imagine that: 10 years later, you may still use our DP30 series which was bought 10 years ago with your brand new digital cinema camera. This could be possible for DP30 s good compatibility, prospective design concept and reliable manufacture standard..
Kindly note:The camera,follow focus,power supply,camera cage rig... for Demonstration Only, Not Included! HI-STRENGTH Professional video matte box adds cinematic elements to your shots & compatible with all DSLR cameras and camcorders. EXCEPTIONALLY DESIGNED with outer diameter of 110mm accommodates wide angle lenses. TWO 4X4 FILTER HOLDERS, one 180 degree rotatable and one Static are perfect for polarized and a combination of square filters. BUILD WITH INDUSTRIAL STANDARD Material easily fits to 15MM RODS with HEIGHT ADJUSTMENT feature of 3cms. EXTRA LONG FRENCH FLAG & ADJUSTABLE SIDE WINGS protect from lens flares and extraneous light. Matte box comes with KNICKER which wraps around the barrel of your lens to block out extra light completely. Universal design for all camcorders and DSLRs & Industry standard 15mm supporting rods, center-to-center rails distance 60mm. For changing lenses quickly, the unit features a swing away design. 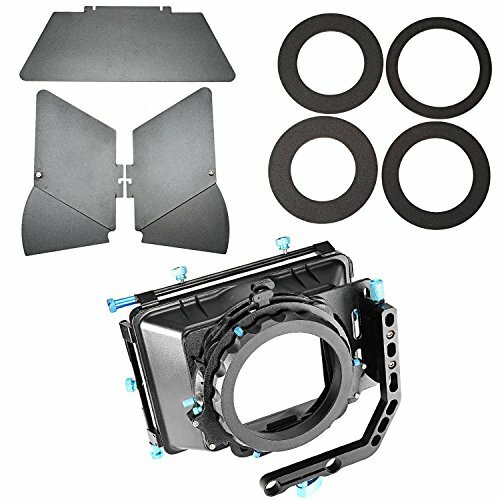 Instead of moving the mounting position of the matte box, (which may be blocked by other rig accessories, or require rod extensions to fit), it can simply be slid outwards with just one screw to undo. It also allows height adjustable. The kit includes one French flag, and two adjustable side wings. Each of the three flapscan be positioned and locked in place so as to suit different focal lengths by providing the maximum amount of shading without getting in the way of the shot. Two pieces of free 15mm rods made of aluminium, length at 300mm. The matte box gives provides the user full lighting control and prevents glare and lens flare with its foldable french flags and adjustable side wings. It features precision engineered Swing-Away mechanism for quick lens changes and allows height adjustable. It also provides a means of using filters and one of the 180 degrees rotating filter trays and much more! 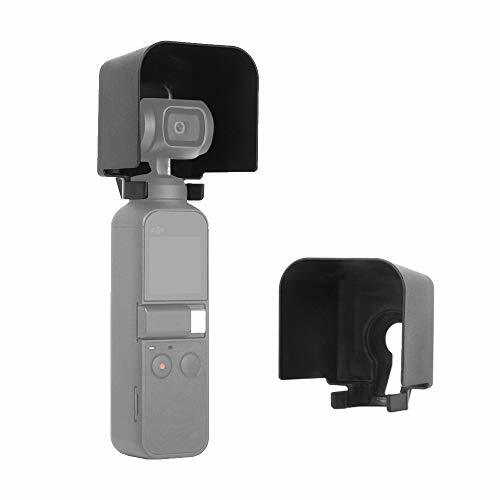 It is specially designed for most DV cameras with wide angle lenses. 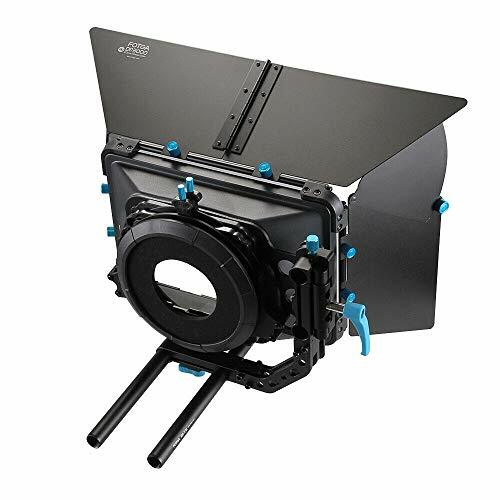 With competitive price, this matte box will be your optimal selection. It will greatly facilitate your digital life. Great for gimbals and drones! 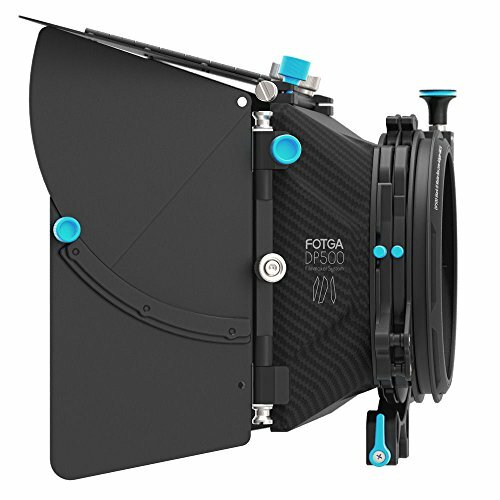 Description: The new FOTGA D500 Mark III Matte box is a professional device universally designed to accommodate all DSLR's and camcorders and it compatible with any industry standard 15mm rail system. 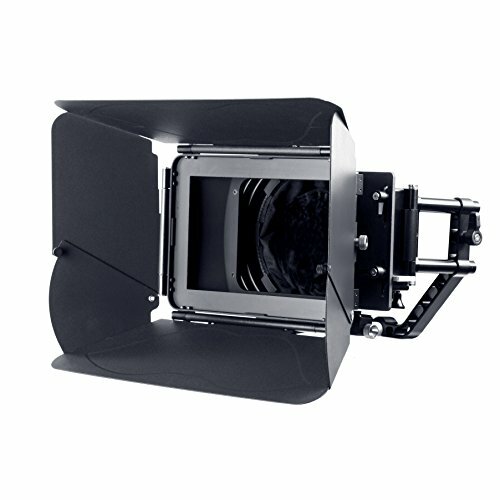 The matte box gives provides the user full lighting control and prevents glare and lens flare with its foldable french flags and adjustable side wings. It features precision engineered Swing-Away mechanism for quick lens changes and allows height adjustable.. It also provides a means of using filters and one of the 360 degrees rotating filter trays and much more! 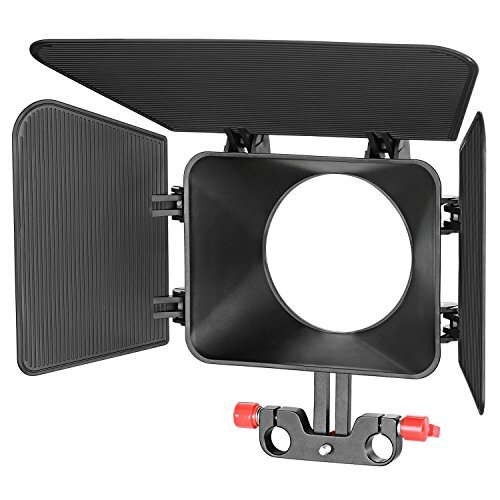 With competitive price, this matte box will be your optimal selection. It will greatly facilitate your digital life. Universal design for all DSLR cameras, video cameras, interchangeable-Lens cameras & Industry standard 15mm rod system and 19mm rod system. Support maximum of 14mm ultra-wide-angle lenses or large lenses up to 114mm in diameter. 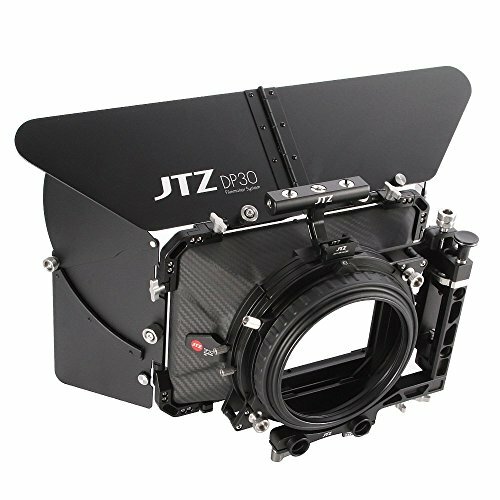 Rugged & lightweight, Made of all metal CNC machined except for the matte box body and filter trays, in the case of ensuring the overall strength and minimize the weight. 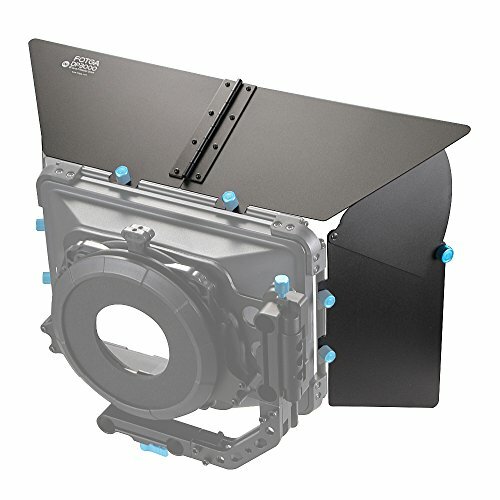 The excellent extinction treatment inside of the matte box, can effectively block the glare and reflected light. For changing lenses quickly, the unit features a swing away mechanism at a 90 degrees and one key to unlock, automatic closure and allow height adjustable. 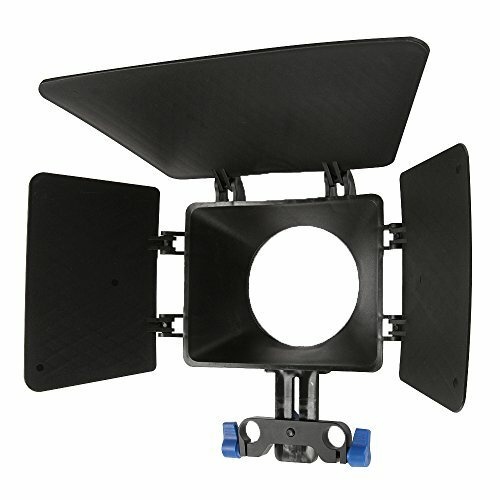 Instead of moving the mounting position of the matte box, (which may be blocked by other rig accessories, or require rod extensions to fit) , it can simply be lifted one key to undo. The kit includes one foldable French flag, and two adjustable side wings. All the flags can be folded and stored for easy carrying. Each of the three flags can be positioned and locked in place so as to suit different focal lengths by providing the maximum amount of shading without getting in the way of the shot. A set of 6 donut rings are included. (Size at 104mm,98mm,88mm,84mm,76mm,64mm ). And comes with two filter trays, supporting 4x4 square filter in thickness from 1mm to 4mm. (One of the trays is up-down adjustable, the other allow rotating 360 degrees) . Also includes one sunshade board sheet (16:9). The MOVO MB400 Matte Box is constructed from machined aluminum & high-grade ABS plastic and making it lightweight and durable. A matte box is an important piece of equipment for anyone who wants to enhance their videography or photography production. There are two main functions of a matte box: one, reduce unwanted lens flares; two, quickly and easily change the filter in front of your lens. Both functions are integral aspects of photography if you want to elevate your craft. The MB400 is compatible with industry standard 15mm support rods and includes a foldable and removable French flag for additional flare control. Also included is a universal anti-reflection fabric donut that provides a light-tight seal between your camera lens and the matte box to further enhance the quality of your image. The MB400 is adaptable to various lens sizes and is also compatible with other accessories. This product is backed by a 1 year manufacturer warranty. Our friendly and responsive USA-based customer service team is ready to help you with any questions or concerns. 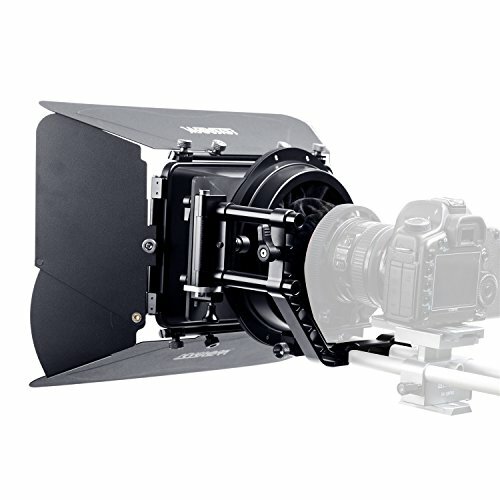 Camtree MB-20 Matte Box with swing away feature is an essence of film making as it strengthens the clarity and contrast. The DSLR matte box which is High strength MatteBox enables the user to get cinematic effects. Mattebox improves the quality of image by manipulating the light coming into lens of the video camera/camcorder.French Flags & Side Flags are fully adjustable for more efficient light control. Height Adjuster enables to adjust the height upto 3cms to match the camera lens. 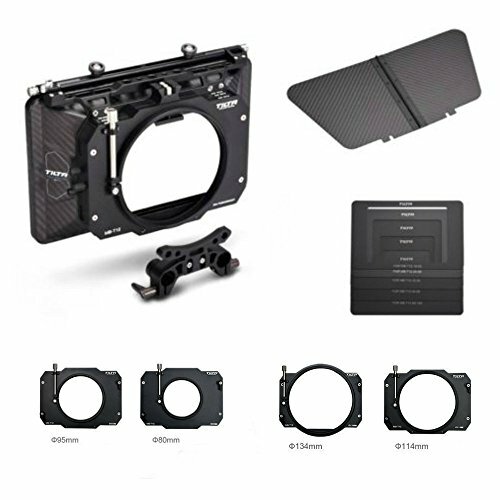 The matte box has two 4x4 filter holder perfect for polarized & a combination of square filters. 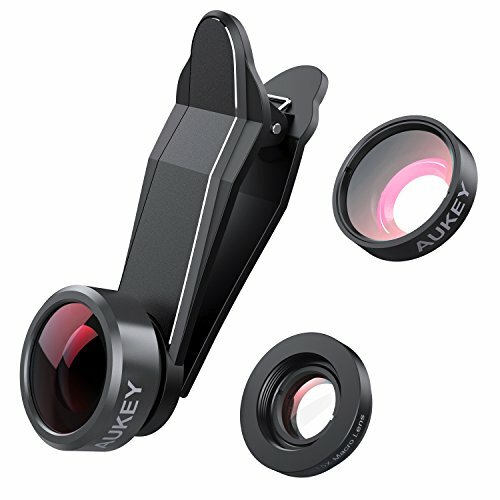 Black Knicker wraps around the barrel of your lens to block out any light completely. Protective Storage case makes the unit travel friendly. 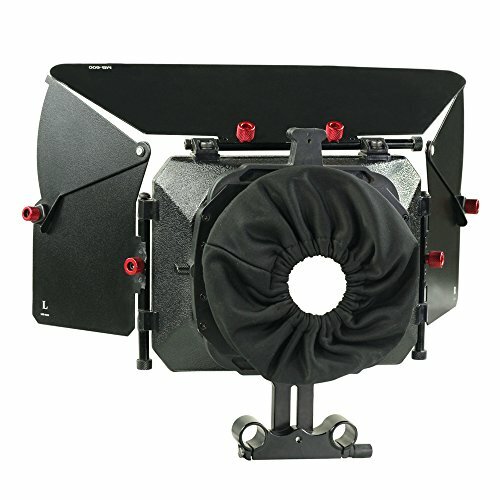 So, a best buy deal which not only makes the matte box rig stylish but also adds professionalism to your shots . Quick release locking design, side-opening door for quick replacement of the lenses. 2pcs filter holders, one is fixed, the other can be rotated 120 degrees. 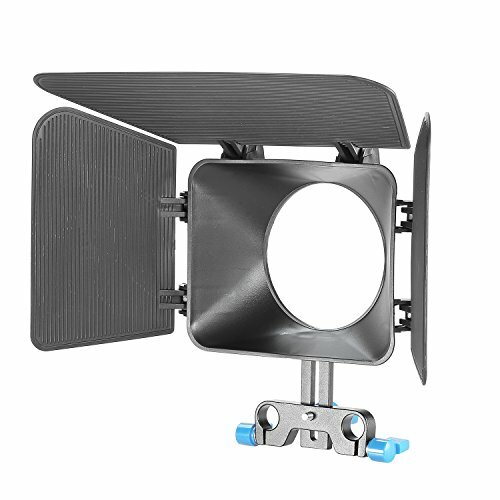 4pcs of removeable sun visor plates instead of 3pcs, the bottom one blocks reflected lights for shooting on the beach, snow, water surface, modern city smooth ground, etc. Black flock inside the 4pcs plates, absorb lights. The left and right sun visor plates open angle can be adjusted. Matte box position on 15mm rail rig can be easily moved forward and backward with one screw. As there are many different cameras with different base plates, we will send the cloth back ring by default. 4pcs of removeable sun visor plates instead of 3pcs, the bottom one blocks reflected lights for shooting on the beach, snow, water surface, modern city smooth ground, etc; Black flock inside the 4pcs plates, absorb lights; The left and right sun visor plates open angle can be adjusted. The SK-MB4 DSLR Matte Box with Top Flags for 15mm Rods from Sevenoak is suitable for use with a wide variety of DSLR cameras and baseplates with 15mm rod system(cameras, baseplates, and rods are not included). It is constructed from high-grade ABS plastic, and the 4 included flags are made from aluminum. It is used on the end of a lens to block the sun or other unexpected light source during shooting. 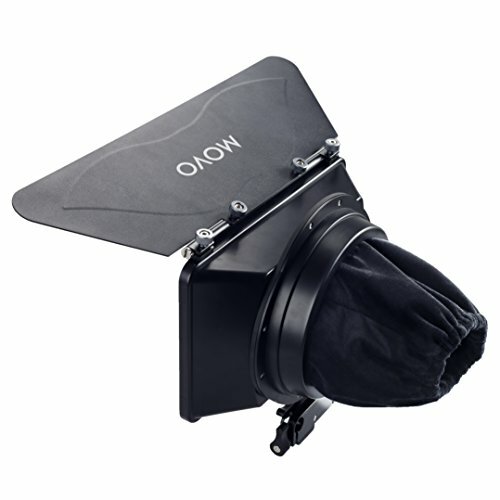 It performs essentially the same function as a lens hood when mounts in front of the lens with one flag. It is a perfect tool for Video Camera Movie Film Making System. . The SK-MB4's height can be adjusted to match the lens of your camera when mounted on a 15mm rod system. The 4 flags are removable using four thumbscrews, and the flag hinges are lockable. The matte box is compatible with wide-angle lenses with the included anti-reflection donuts. 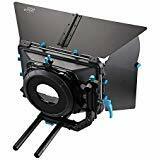 The MOVO MB100 Matte Box is constructed from high-grade ABS plastic and precision machined aluminum making it lightweight and durable. A matte box is an important piece of equipment for anyone who wants to enhance their videography or photography production. There are two main functions of a matte box: one, reduce unwanted lens flares; two, quickly and easily change the filter in front of your lens. Both functions are integral aspects of photography if you want to elevate your craft. The MB100 is compatible with industry standard 15mm support rods and includes a foldable and removable French flag for additional flare control. Also included is a universal anti-reflection fabric donut that provides a light-tight seal between your camera lens and the matte box to further enhance the quality of your image. The MB100 is adaptable to various lens sizes and is also compatible with other accessories. Cavision MB385PW wide, clamp on Matte Box accepts 3x3 filters of various types; it features two filter holders and the ability to work with industrial cameras to smaller Mini DV camcorders.This model incorporates a 85mm back mount opening for use with the optional ARP series adapter rings that will snap into the back-mount of the matte box; you can then use it in combination with the step down rings to various diameters. Versatile Camera Upgrade Turn smartphone photography into a true art form. Take shots that stand out from the crowd and don't be limited by the fixed perspective of your smartphone camera. Experiment with different effects and fields of view. Get Creative Capture incredible 198 field of view fisheye shots with dramatic black circle effect. Snap selfies, portraits, flowers, insects, weddings, large group photos, architectural shots, cityscapes, and wildlife. Crisp Macro Details Capture ultra-sharp 15x close-up photos of small scenes and objects. Highlight interesting details and textures of your subject. Fascinate your audience with robust views of tiny subjects and environments. Universal Compatibility Easily clips on to any mobile device with included clip. Fits the front and back cameras of most smartphones and tablets, and even works with laptop webcams. No complicated setup, no special mounts needed, just clip on, focus and click for high impact wide angle, macro, or fisheye images and videos. 24 Month Warranty Whether it's your first AUKEY purchase or you're back for more, rest assured that we're in this together: All AUKEY products are backed by our 24 Month Product Warranty. 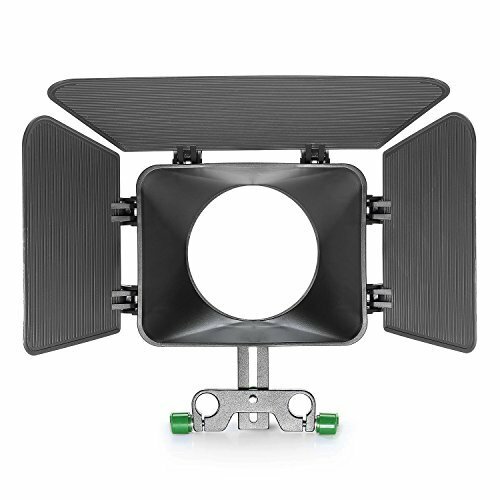 Solid built and easy to use, this matte box has detachable and easy lock-on flags that will help you block undesired light and lessen glare or lens flare in your image. Upgraded with a swing away option, you don't need to bother with endless mounting and dismounting any more. Put it back or swing away at anytime you want. The newly added two filter trays are made to insert squre filters in front of your camera, so that dramatic and artistic effect can be made in your filming. This matte box can fit 15mm rod with 60mm center to center rails distance, comes with 4 donut rings for need of suiting different size of lens. Installation is easy. Therefore,you can carry around with you whenever is nessary for the scene. Proaim Camera Professional Matte Box is specially designed for all DV / HDV cameras with normal and wide angle lenses. Proaim Matte Box works same as the lens hood but provides extra and better protection against flare and light penetration. The DSLR Matte Box has LONG TOP FLAG & SIDE BARN DOORS for extra protection from direct light. It has two 4x4 filter holder(s) perfect for image effects. ROTATING FILTER HOLDER(s) allow the user to remove or install square filters without disturbing microphone or flash settings. The METAL FRONT ADJUSTER with quick lock mechanism attaches easily to the 15mm rods and allows height adjustment of 3.5cm. It INCLUDES KNICKER; black-out fabric cover which wraps around the barrel of your lens to block out any light completely. Proaim Video Camcorder Matte Box comes with INTERCHANGEABLE MASKS of 4:3 and 16:9 aspect ratios format so it can be used with both normal as well as wide angle lenses.This matte box is EASILY DETACHABLE, LIGHTWEIGHT and is made up of high-quality strong material. Absolutely meet your needs and fits your budget!! 100% Customer Satisfaction Guaranteed; Buy with Confidence. Lens Cover can prevent extra light effect the camera to spoil the photos. 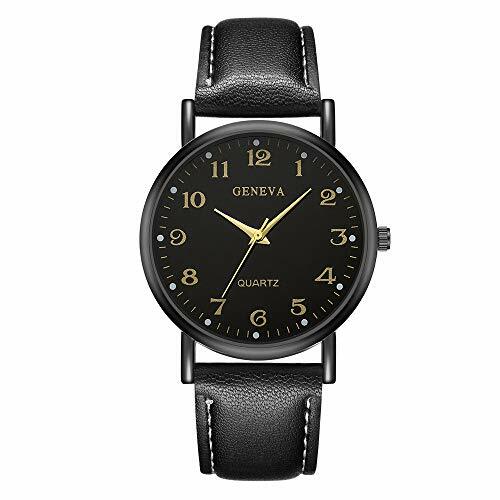 Made of high-quality ABS material.Light weight and durable. Perfectly Cut,Tool Free installation,easy to take out. Must-have accessories in summer for OSMO Pocket. Note:OSMO Pocket is not included.